My teaching partner and I have been working with our students on coding this year (see here and here and here). We’ve figured out how to make coding a regular part of our week…and our students are having success with planning, creating, and debugging. We’re planning a “winter scene” challenge for next week to celebrate the Hour of Code…more about that next week. So this week in addition to our digital work as programmers, we have given students a design challenge…making snowflakes. These southern CA kids have limited experience with snow (as do I), but learning about snowflakes is fascinating. We started by reading Snowflake Bentley about Wilson Bentley–a man obsessed with photographing snowflakes using a camera attached to a microscope (back before the technology was very developed). He showed a tremendous amount of tenacity and grit in his efforts…and finally published his book of snowflake photos when he was 66 years old. 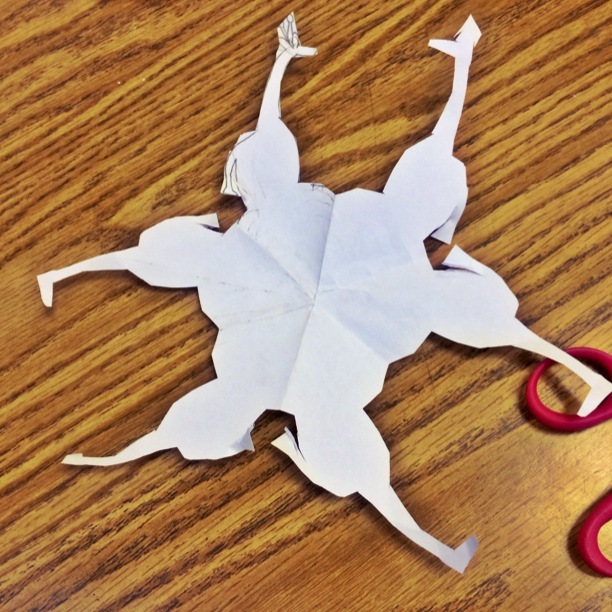 We knew that creating hexagonal snowflakes (by cutting paper) would be challenging for our students, but we decided that this purposeful opportunity to iterate…study mistakes and learn from them for their next attempt, would be a perfect platform for helping to build grit and tenacity. And then to add to the challenge, inspired by Zoo Flakes ABC, our students are creating hexagonal snowflakes in the shape of animals. 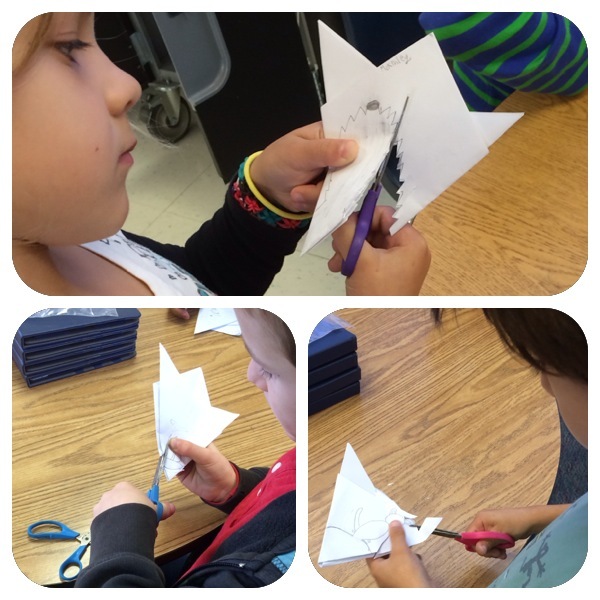 Yesterday they learned to fold and began drawing their animal to cut. Today they tried out their design by cutting out their animal. There were many failures–unconnected pieces that looked nothing like animals or snowflakes, whiny “this is hard” comments, and requests for help cutting (we deferred, reminding them it was a perfect opportunity for practice). There were some semi-successes with 6 intact “arms” of something like an animal shape. And there was lots of concentration and studying of the results. We studied our successes and failures…and then looked at some more “expert” attempts online. We considered ways to improve even those attempts that were “successful” (in the sense that a snowflake-like shape resulted). And students are ready to try again tomorrow. But best of all there were no tears and everyone gave it a try today. 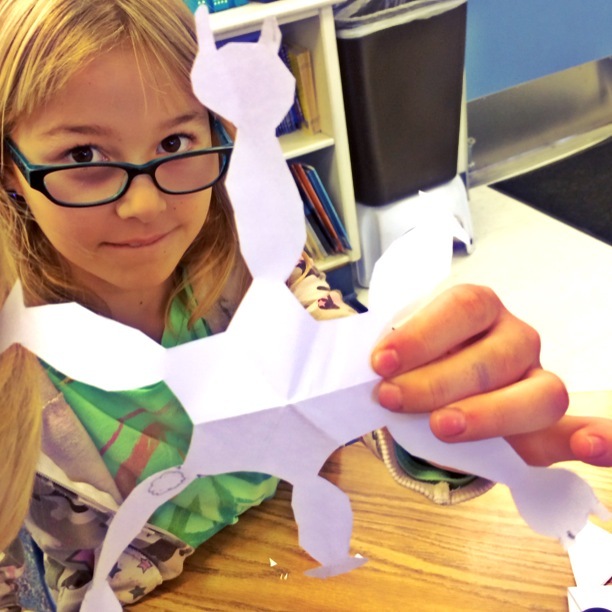 Our students were focused on their design and their cutting…and desperately want their snowflakes to work out. We’re excited about this project…and all that our students will gain from these iterative efforts. I’ll let you know more as we progress through this project! What do you do to help your students study their mistakes and try again? This entry was posted in making, teaching and tagged design, grit, iteration, Snowflake Bentley, snowflakes, tenacity, Wilson Bentley on December 4, 2013 by kd0602.